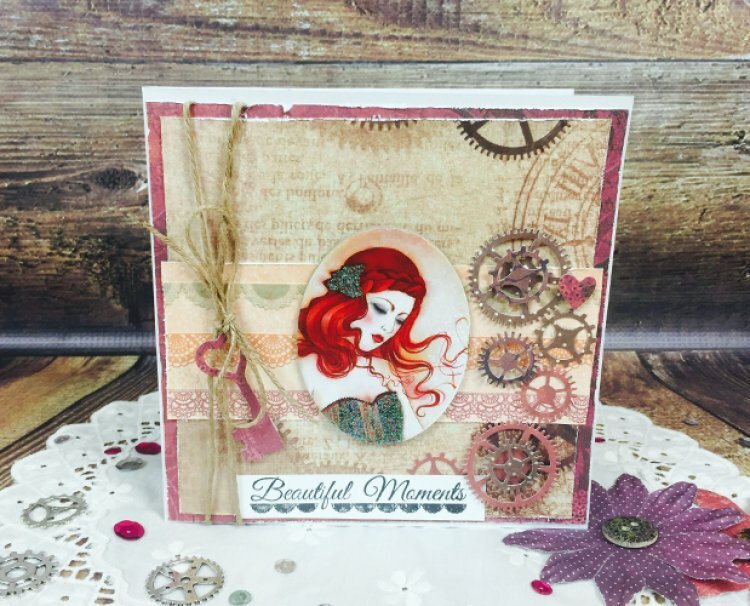 Add colour and depth to your craft projects with our card tutorial using the captivating new SANTORO®'s Willow vibrant Character Topper and Steel Die set. 1. With your chosen paper, cut it to 15cm x 14.6cm and distress the edges. We picked the beautiful floral burgundy embossed paper for our background paper. With a contrasting paper print, create a 14cm square and distress. Stick this onto the top of the burgundy paper with double sided tape. 2. We have then created a band to go across the paper by cutting another piece of contrasting paper to 14.4cm x 5.6cm and distressing the edges. Layer this on top of your other papers using double sided tape. We then added a SANTORO®'s Willow Character Topper to the centre of the paper. 3. To decorate the card, we have die cut the cogs, key and a small heart from the SANTORO®'s Willow Steel Dies set. We have stuck the cogs on the right hand side of the card, using foam squares or glue to keep them in place. On the large cogs, we have added a smaller cog to the centre with foam squares to add dimension to the card. Add a single small heart to the right hand side of the card using a foam square. 4. Wrap the SANTORO®'s Willow Jute String around the left hand side of the card twice and feed a single die cut key to the jute before making a bow. Use doubled sided tape on the back of the jute and the back of the paper and stick to the pearlescent card blank. 5. To finish, stamp the ‘Beautiful Moments’ sentiment stamp on a separate piece of white paper and cut to size. Once dried, stick this to the bottom of the card. What would you make with the new SANTORO®'s Willow collection? We would love to hear your ideas, just comment below & don’t forget to add your projects to the gallery.